The worlds of fashion and fantasy collide courtesy of Steven Meisel's lens in the September 2012 issue of W Magazine. 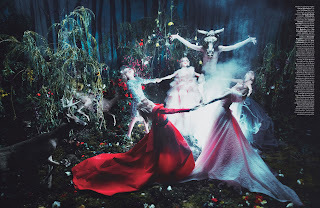 Meisel's creative vision is taken to full effect in a bewitching editorial set in an enchanted forest. Guido Palau, Pat McGrath and Edward Enninful transform models; Hanne Gaby Odiele, Anniek Kortleve, Meghan Collison, Rachel Trachtenburg, Peyton Knight, Mae Lapres, Ethan James, Yuri Pleskun, and Aaron Vernon into a cast of ghouls, ghosts, fauns and demonic living dolls. 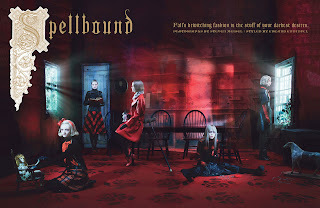 Entitled "Spellbound", the editorial takes W's readership on a spine-tingling journey not for the faint of heart, replete with haunted houses, ritualistic ceremony and slaughter. The editorial is also sure to stir controversy in fashion circles for it's use of underage American model thirteen-year old Peyton Knight. Perhaps W Magazine missed the Health Initiative Pact's recent recommendation which discourages the use of models under the age of sixteen?